Lovely page, you tackled the challenge well! What a beautiful place to visit!! 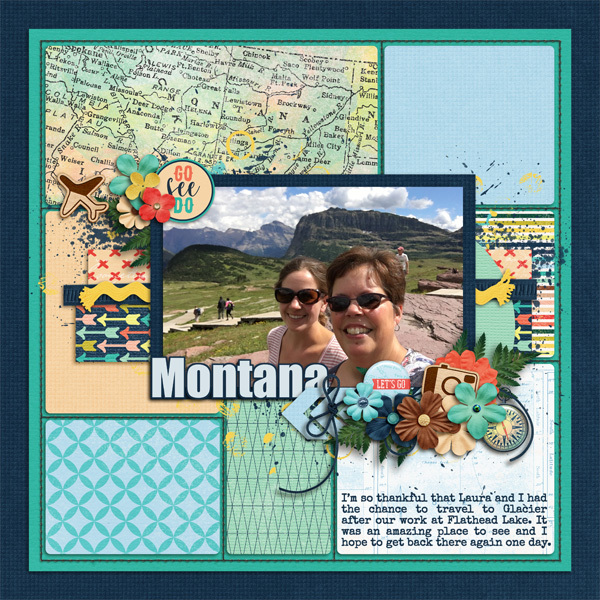 Love the travel patterns and colors of this layout, but your photo being able to shine is amazing! Oh this is gorgeous. I love the blocking and paper strips. And I love the beautiful photos and clusters. Hi Lori! I've never been to Montana, but that view is so pretty! That looks like such a beautiful area! How fun that you had the opportunity to visit. Your travel page is fabulous! Looks like a wonderful trip!! I love all the patterns you used in the background. You did a fabulous job blending the 2 templates!